I tried quite a few things that I've never done before. 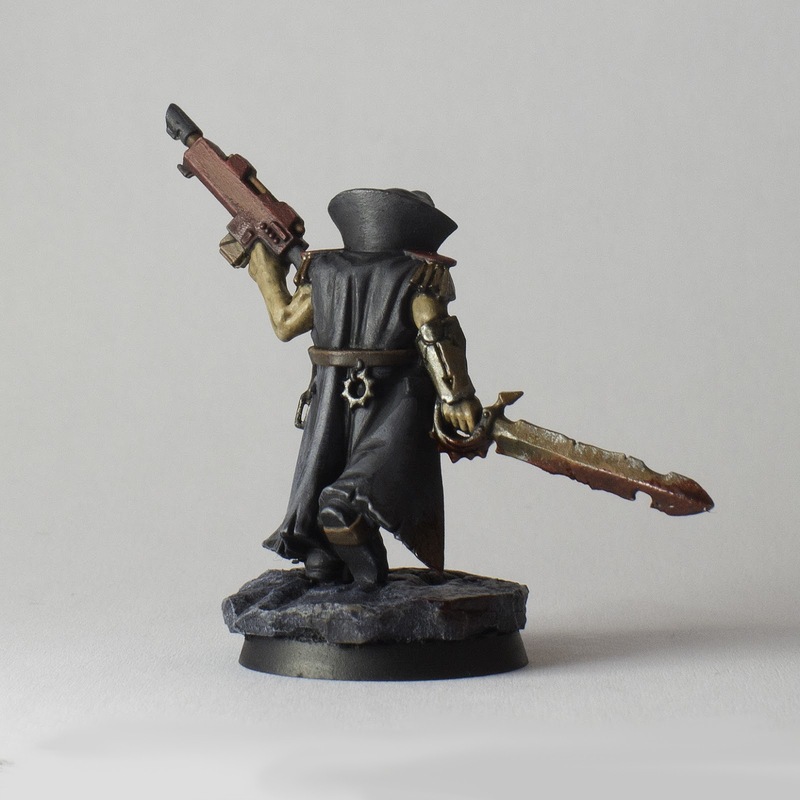 Since I've only painted loyalists I never had any reason to paint rust, so I went all out on this guy. I also just got a pot of Tamiya clear red in the mail and used it to make some great looking blood dripping off his sword. I love this stuff. I plan on using it often on future chaos models. I did something completely new for his base. I used sculpey which I pressed a rock into to make great realistic rock texture and carved some runes into the ground. And last but not least, I did my very first greenstuff work. It's the little skull on his hat. It's not much, but a nice way to get used to greenstuff. I really like it and I plan to do much more greenstuff work in the future. 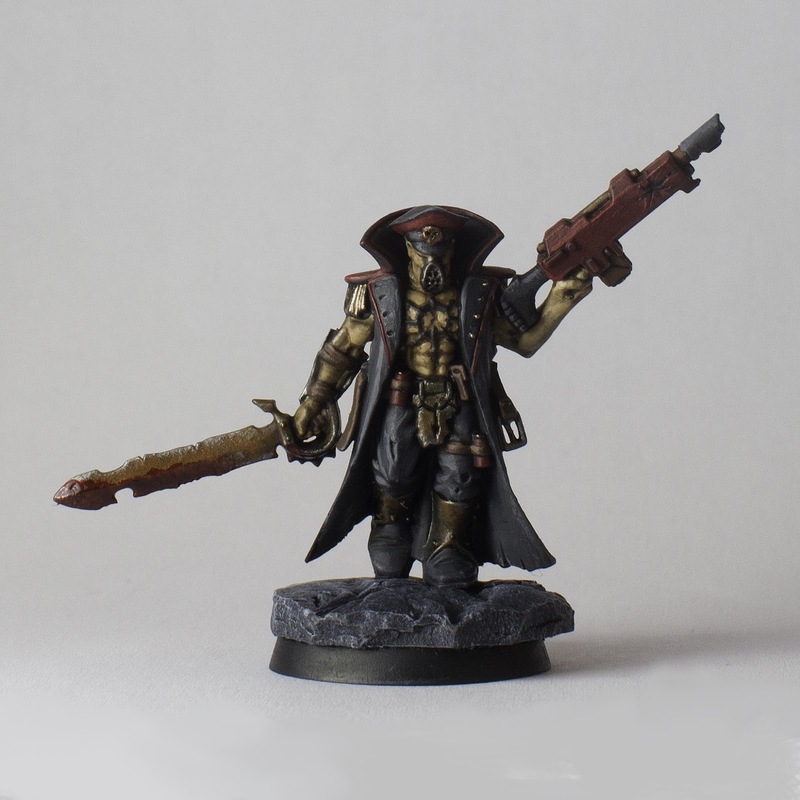 Thanks for reading, and be sure to check out the Standard Template Construct's painting contest and vote for your favorite paint job and conversion. Very nice. Welcome to Chaos! Thanks! I'm liking it so far. I plan on doing a lot more chaos. They're really fun! I really dig the commisar-looking champion. Its simple but still looks great. I only wish he could actually have a cc weapon and an autogun. Guess the lasgun will have to be counts as shotgun instead :( keep up the good work! Well I should have read the rules a bit closer. Guess I can count it as a shotgun or just say it's a laspistol. Oh well, I think it looks cooler this way. Very nice. Love that sword and those rusted greaves on his boots. I plan to pick up some Tamiya clear red on Friday. I usually make my own blood from various paints and inks and just use water FX but sometimes I just want an easy and great looking way to do blood and that stuff looks so great everywhere I see it. Any tips or is it just apply as you like? The only thing I did different is that I mixed in GW Nuln oil instead of black ink for the second step. Thanks. I'm definitely up for trying this out on my DV chosen. Bloody Night Lords, yay! Nice first foray into the GS world :) Well done! I like the paint scheme and the flesh looks great. I think if you gave a wash over the reds, then highlighted them back up, it would add another depth of color to the model. I actually did that already. 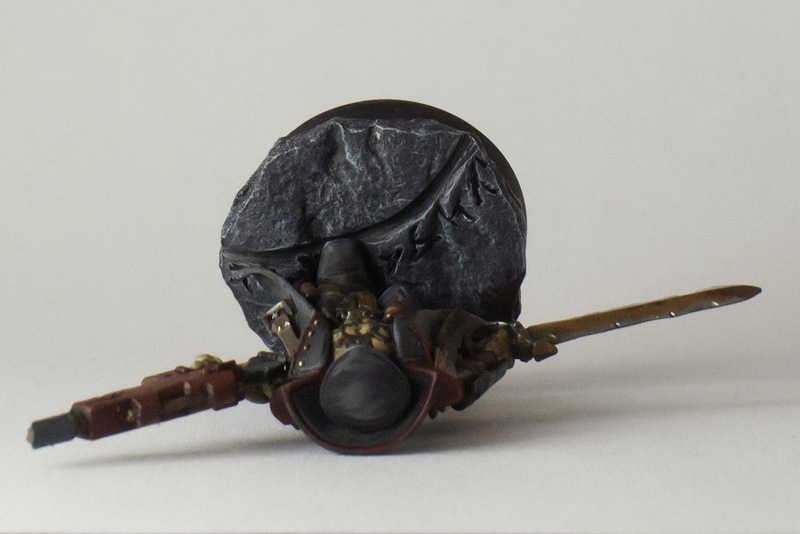 I washed it with Agrax earthshade and highlighted it up to wazdakka red. But I think you're right, there isn't a ton of contrast, so another round of wash/highlights would probably be good. Thanks for the comment!